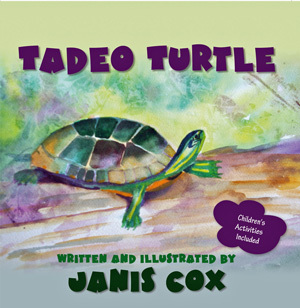 Tadeo Turtle – written and illustrated by Janis Cox. Tadeo won the best children’s book at The Word Awards in Mississauga, Ontario, Canada on June 12, 2013. The Word Awards are sponsored by The Word Guild. To see the press release visit Press Release Page. To buy Tadeo Turtle please go to my Bookstore. Tadeo (TAHD-ay-OH) longs to be different. Through an exciting adventure, find out how Tadeo learns to accept how God created him. Thank you for the lovely compliment. I look forward to hearing your thoughts on my book. Just wanted to pop over to say thanks for your comment on our flower pounding activity. Also, I LOVE your illustrations – simply beautiful! Thanks so much for dropping by and for your kind words. Over two years later I find your comment. I remember your flower pounding activity. It was great. I really like the message and tone of the book. I’m bookmarking this page to come back to. I love children’s books with ‘value’ lessons and without reading it, I can tell this is one of them. Thanks so much. I hope you visit often. Thank you for inviting me to check “Tadeo Turtle” Janis. It truly looks like a good story with content and values and beautiful illustrations. I will have to keep your book in mind for when I explore the pond theme again next year with my children. Thanks for your lovely comment. I would love to see you use my book in your pond theme. Thank you so much. It is great to get encouraging comments. Nice cover, I like the colors!